Elisa Ruffino is the Director of Designmatters at Art Center College of Design, where she is responsible for overseeing management of the Designmatters’ portfolio of ongoing projects, and leading the program’s operations. Elisa is the project development liaison between Art Center creative teams and Designmatters’ collaborators in the nonprofit, government, global development, academic and business sectors, to yield the program’s trademark real-world outcomes. 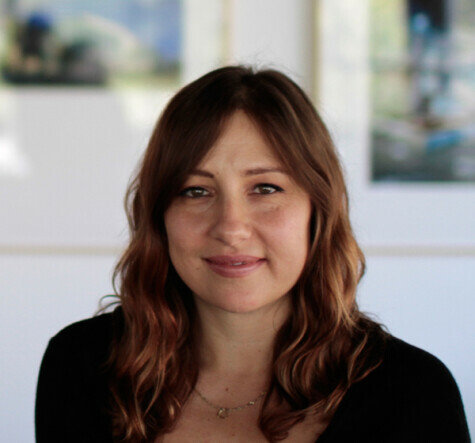 Since joining Art Center in 2002, Elisa has worked closely with the College’s students, faculty and alumni to produce several award-winning awareness campaigns, publications, and documentary films. In 2010, in response to the release of USGS scientific data foretelling a plausible catastrophic winter storm that would devastate economic and emergency management systems across California, she convened a top team of faculty, students and alumni on the multi-faceted USGS ARkStorm project. Under Elisa’s leadership the initiative produced two short films, an identity system, and a key role for Art Center in the USGS-hosted ARkStorm Summit in Sacramento in January 2011. There, the team conceived the Summit’s programmatic activities and immersive working sessions, which resulted in catalyzed discussion and consensus among more than 200 participants including emergency managers, structural engineers, meteorologists, business leaders, and policy makers at the local, state and federal levels. In 2012/2013, she provided strategic project development to the pilot implementation of the award-winning Where’s Daryl education toolkit, and its rollout across several schools in the LA Unified School District.